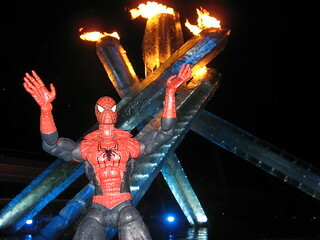 I almost can't believe it, but the last time I posted a Spider-Man picture was in December 2008! That's a long time ago. I had already planned to do this, but thanks to Jill's spurring on, it made me do it faster. So far, the fences are still up around it but apparently "engineers" are working on a solution to be able to get people to be able to get closer to the fire. I know this because a Montreal cop told me this as she laughed at me taking these pictures. 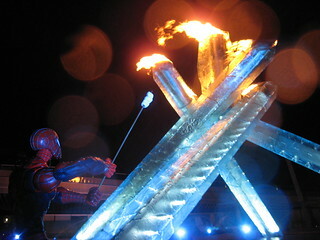 I at first wanted to have Spider-Man waving a Canadian flag, but seeing as how I didn't have any small ones, I made him hold a skewer of mini marshmallows, yeah! How did you manage the pictures without chain-link-fencing appearing? Are you holding Spidey with your arm sticking through the fence? 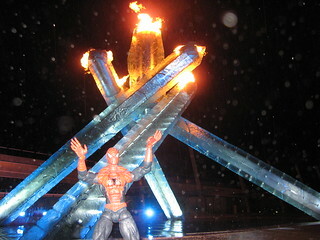 in the last picture, there's some weird reflecting of light because there's blue lights pointed at the cauldron now (they were placed slightly behind me, and you can see some on the opposite side) otherwise spider-man would have been better lit/visible, i tihnk.